Cookie Jam developer Jam City has laid off a significant number of developers. An anonymous source speaking to VentureBeat said that a “significant number” of employees had lost their jobs last Friday. Neither the source nor Jam City itself have released an exact figure. At least one named source also confirmed the redundancies. 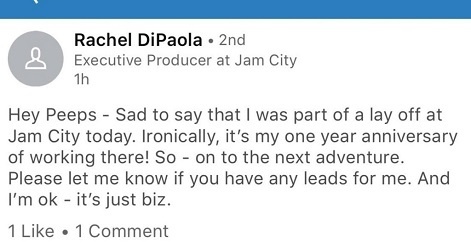 In a now-deleted LinkedIn post (below), former Jam City executive producer Rachel DiPaola claims that she was a part of layoffs at the company. The layoffs seem to affect Jam City’s studios in Los Angeles, San Francisco, and San Diego. “Jam City rolled out organizational changes today that altered some teams and staff positions,” said the company, in a statement. “We are re-allocating resources to support the goals of our global business. News of layoffs may come as a surprise, as Jam City only last month secured a partnership with Disney to develop multi-year licensed titles. And just last week, Jam City acquired the Bingo Pop IP from developer Uken Games, snagging a new Toronto studio in the process.